Creativity meets high-tech – a few words that perfectly sum up the atmosphere at this year’s Texprocess from 9 to 12 May. 312 exhibitors from 35 countries (2015: 273 from 33 countries ) presented their latest developments for processing textile and flexible materials to 13,718 visitors from 109 nations (2015: 13,335 from 94 countries). With 14 percent more exhibitors and 2.9 growth on the visitor side, this was the biggest ever Texprocess. “The innovative power of the textile-processing industry is impressive. At Texprocess, trade visitors can find high-performance machines and technologies for all stages of textile production, from computer-aided design to recycling. Here, trade visitors can discover how the increasing digitalisation level has boosted the degree of interaction between people and machines, and the level on which machines are linked to each other”, says so Detlef Braun, Member of the Executive Board of Messe Frankfurt. The combination of Techtextil and Texprocess has proven beneficial on both the exhibitor and visitor sides. A total of 7,091 visitors from the concurrent Texprocess (2015: 5,500) also attended Techtextil. At the same time, 11.399 Techtextil visitors (2015: 7,600) went to see the range of products and services at Texprocess. For its part, the Leading International Trade Fair for Processing Textile and Flexible Materials attracted 312 exhibitors from 35 nations and 13,718 visitors from 109 countries. Together, the two fairs welcomed 1,789 exhibitors from 66 countries (2015: 1,662 from 54 countries) and over 47,500 visitors from 114 nations (up around 14 percent, 2015: approx. 42,000 from 116 countries). The increase in the number of visitors to Texprocess came primarily from Europe. After Germany, the best represented visitor nations were Italy, Romania, Portugal, Turkey and Poland. There were increases in visitor numbers especially from Russia, the Ukraine, India, South Africa, Pakistan, Sweden and Japan. 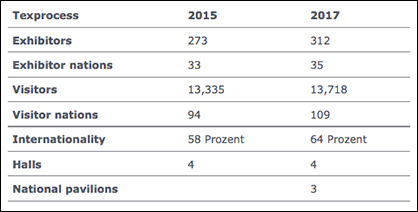 On average, visitors spent longer at this year’s Texprocess than at the previous edition of the fair. In 2015, around 50 percent spent a day at the fair. This year, almost 65 percent of visitors remained in Frankfurt for two days or longer. Growth on the exhibitor side came mainly from Turkey (+10) and Italy (+9), as well as from China (+9) and Japan (+4). China, Japan and Taiwan were also represented by their own national pavilions at Texprocess. Altogether, 204 international companies (2015: 161) and 108 from Germany (2015: 112) made presentations at the fair. The winning products of the Texprocess Innovation Award also made use of digitalisation: Coloreel from Sweden won with a technology that makes it possible to dye the white base thread during the embroidery process. Japan’s Juki company presented the world’s first sewing machine for which, inter alia, thread tension and stitch length can be adjusted and stored via a touchscreen on the machine or via a special app. 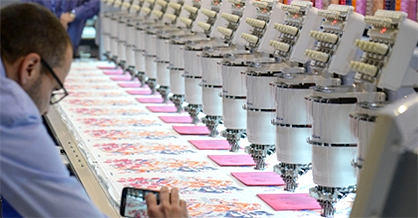 Industrial-sewing machine specialist Xi’an Typical Europe showed a new technology that permits pedal-less sewing. The Bielefeld-based Dürkopp Adler company presented an online monitoring system for industrial production. 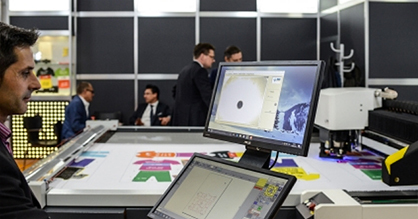 For the first time, Texprocess concentrated the joining and cutting technology product groups, CMT (Cutting, Making, Trimming), CAD/CAM and printing in a single exhibition hall and the Techtextil exhibitors from this segment presented their technologies at Texprocess. These product groups were removed from the Techtextil nomenclature. With 49 percent, design, CAD/CAM and cutting ranked among the most popular product groups. The software packages of the CAD/CAM suppliers at Texprocess covered a broad spectrum of solutions from modular components to an all-embracing PLM solution with maintenance and repair by remote control and automated replacement and wearing-part ordering. For example, Kuris Spezialmaschinen GmbH showed a new generation of high-ply cutters and a fully automatic labelling unit, as well as an up-dated single-ply cutter series for cutting textiles, foils, leather, plastics, prepegs, glass, carbon fibre and honeycomb materials. Gerber Technology focused on holistic and personalised concepts for customers’ individual production environments and, in addition to its PLM systems, launched its consulting programme for implementing digitalisation strategies in the textile-processing industry. For the first time, Texprocess demonstrated integrated garment-production live with the ‘Digital Textile Micro Factory’. Organised by Texprocess in cooperation with the German Institutes for Textile und Fibre Research, Denkendorf, and renowned companies from the textile sector, the micro factory presented the complete production of garments – from design, via digital printing, to automatic cutting and making up. A marked route guided trade visitors through the various stages, from CAD / design, via printing, cutting and making-up, to labelling. The micro factory was supported by VDMA Textile Care, Fabric and Leather Technologies. Besides the thematic focus on digital printing, the WTiN information service organised European Digital Textile Conference for the first time in cooperation with Texprocess and Techtextil. In addition to decorating fabrics, digital textile printing is used to functionalise textiles with dirt-repellent, anti-microbial and fire-proof properties. A significant increase in the number of visitors was also recorded at Texprocess Forum and, in the case of the lectures on digitalisation solutions for the garment-manufacturing industry, fit optimisation in the online age and Industry 4.0, several visitors had to stand because all seats were taken. Moreover, exhibitors and visitors profited from the ‘Living in Space’ exhibition at Techtextil, which was organised in cooperation with the European Space Agency (ESA) and the German Aerospace Centre (Deutsches Zentrum für Luft- und Raumfahrt – DLR) and showed the variety of applications for technical textiles and illustrated their processing by reference to space travel. The second edition of the Innovative Apparel Show provided a stage on which fashion academies from France, Italy, Portugal and Germany could present creations made of technical textiles using innovative processing technologies. In the two daily live shows, visitors were shown visionary fashion designs for ‘textile effects’, ‘creative engineering’ and ‘smart fashion’. This year, the fashion academies taking part were the Esmod from Paris, the ESAD College of Art and Design from Portugal, the Accademia Italiana, Florence, and Trier University. Julia Gross-Müller of Trier University won first prize of the Innovative Apparel Public Award. Entitled ‘World Folklore’, her model, which combines traditional and innovative processing technologies, was the favourite among visitors. Second place went to Mariana Almeida of ESAD College of Art and Design in Portugal for ‘Momentum’, a smart fashion combination that shows the wearer’s mood. Third place was taken by Eleonara Beni of Accademia Italiana in Florence with an urban-style, multi-functional combination. As in the past, Texprocess was held concurrently with Techtextil, International Trade Fair for Technical Textiles and Nonwovens, which welcomed 33,670 visitors from 104 nations and 1,477 exhibitors from 55 countries. Altogether, the trade-fair duo was attended by 1,789 exhibitors from 66 countries (2015: 1,662 from 54 countries) and 47,500 visitors from 114 nations (2015: 42,000 from 116 nations).